This is the first in a special series of Raiders News Network interviews focusing on the 60th Anniversary of the 1947 Roswell, New Mexico, UFO Incident. HORN: Stanton, Roswell is the pre-eminent story of Ufology. Some say whatever occurred near Roswell, NM, in July 1947 will never be known. Others like you disagree on some levels. You and Bill Moore brought this story to light many years ago. This is the most appropriate place to start this series, so please tell us how that happened. STAN: I first heard of Roswell in the early 1970s from a woman named Lydia Sleppy whose son was a forest ranger in California. He had had a good sighting. My associate (Bobbi Ann Slate Gironda , long deceased) and I spoke with him and he suggested we talk to his mother who had had a good sighting near Albuquerque. We did speak to her and after she told us about the sighting, she mentioned that when she had been working at an Albuquerque Radio Station in the late 1940s, she was asked to type the story coming in from a broadcaster at their Roswell affiliate station for a newswire. He dictated how a flying saucer had been recovered and was being sent to Wright Field. Part way through the story the bell went off on the machine she was using to put the story on the news wire. The FBI instructed her not to continue the transmission. She remembered the names of some of the people and I located several, but came to a dead end. I should stress that New Mexico was a hotbed of classified Research and Development activities and certainly it was expected that there would be spies and counter intelligence concerns. In 1978 I was in Baton Rouge, Louisiana, at a TV station to do three interviews before my lecture "Flying Saucers ARE Real!" that evening at Louisiana State University. I had done two, but the third reporter was nowhere to be found. The station manager was giving me coffee, looking at his watch, and was embarrassed as he knew the person who had brought me to the station and that I had other things to do. Out of the blue he told me that the person I ought to talk to was Jesse Marcel over in Houma, Louisiana. I asked "Who is he?" He answered "Oh, he handled wreckage of a flying saucer when he was in the military. We are old Ham radio buddies." The reporter finally showed up and I was busy the rest of the day. Next day from the Airport I called information and then spoke with Jesse who told me his story. 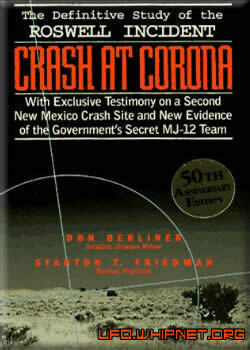 This is described in detail in "Crash at Corona: The Definitive Story of the Roswell Incident" by Don Berliner and myself and available from my website at www.stantonfriedman.com. Jesse didn't have a precise date. I shared the story with Bill Moore (we had known each other in Pittsburgh, years before). I also saw him months later in Minnesota the day after meeting with Vern and Jean Maltaise of Bemidji, MN, who told me a story of their friend Barney Barnett who had come across a crashed saucer and strange bodies in New Mexico. Bill had a 3rd story (From the Flying Saucer Review) about an English actor named Hughie Green who heard a story on the radio about a New Mexico crashed saucer when driving from Los Angeles to Philadelphia. He could pin down a date (early July, 1947). Bill went to the U. of Minnesota Library and found the stories in newspapers in the periodicals department. These gave us an independent check on Jesse's story and the names of many more people . By 1980 we had located 62 people. That is when the first Roswell book "The Roswell Incident" by Bill Moore and Charles Berlitz was published. Bill and I did 90% of the research. By 1986 we had published several more articles and the total was up to 92. This was all before the internet made searching a lot easier and cheaper. I instigated, and was in, the Unsolved Mysteries NBC TV program about Roswell in 1989. It was well done and was seen by 28 million people. Many others have joined in, some of the noisy negativists from their armchairs, and, of course, the government has issued two large reports full of misrepresentation and anti-UFO propaganda. I am still checking on some leads... and correcting the false information put out by the noisy negativists. HORN: In 1984, a Hollywood movie producer named James Shandera investigating the UFO phenomena receives an anonymously mailed package of 35 mm film. It supposedly contains images of a top secret Government report, later named the "Majestic Twelve (or MJ-12) documents." You wind up with these documents. Tell us about that, and do you still believe some of the Majestic 12 documents are genuine? STAN: I had introduced Jaime to Bill Moore while I was living in California and worked with Jaime and Bill briefly on a fictional movie that didn't get very far in 1980 before I moved from California to New Brunswick, Canada. Jaime and Bill worked closely together, saw each other often and worked with several insiders. We kept in touch by phone and during my travels. The film had two identical sets of 8 negatives each. The document was classified TOP SECRET/MAJIC. The title on the first page is "Briefing Document: Operation Majestic 12" Prepared for President Elect Dwight D. Eisenhower, 18 November, 1952. I was notified about its receipt and we cooperated on trying to determine whether the original two documents, the briefing and p.8, a memo from President Truman to Secretary of Defense Forrestal (Sept. 24, 1947) authorizing Operation Majestic 12, were genuine. Another brief Top Secret Restricted document, a memo, July 14, 1954, from Robert Cutler to General Nathan Twining, one of the MJ-12 members, was discovered at the National Archives. A very important part of my research dealt with my very surprising finding that Dr. Donald Menzel, who was an astronomy Professor at Harvard and had written 3 anti-UFO books, and who was listed as an MJ-12 member, actually led a double life doing highly classified work for decades for the NSA, the CIA, and 30 companies. My book TOP SECRET/MAJIC gives the whole story and demonstrates that none of the myriad of anti-MJ-12 arguments stand up to careful scrutiny based on my visits to 20 archives and my 14 years of work on classified programs. It also demonstrates that there are a number of phony MJ-12 documents out there as well. HORN: I talked with Jesse Marcel Jr. not long ago. He has a new book coming out that will be launched at the Roswell festival. He does not buy the Mogul balloon explanation about Roswell. What's your take on this? STAN: The ridiculous MOGUL explanation put forth by Colonel Richard Weaver simply doesn't stand up to careful review as is noted in "Crash at Corona" and in several other of my papers. That his specialty is disinformation becomes quite clear. Mogul doesn't cut it. The materials don't match witness descriptions in terms of the characteristics and the quantity . Dr. David Rudiak at his website shows that no Mogul balloon could have landed on the Brazel ranch. Enginer Robert Galganski shows the amount of material is a total mismatch . If it doesn't fit, one must acquit. HORN: Could the crash test dummies explain reports of alien bodies? 1. All were dropped in 1953 or later; a minimum of 6 years after the Roswell crash. Last I heard, nobody had invented time travel, even for crash test dummies. 2. I met with Colonel Madson, who had been in charge of that program. For the tests to be meaningful, he noted that the dummies were 6' tall and weighed 175 pounds to match pilots. There was no way to morph them down to 4 foot tall skinny little guys with four fingers and big heads..
HORN: Do you believe the government is covering up the truth about flying saucers? HORN: Why would they do that? What benefit is it to them to cover up the truth about flying saucers? HORN: Now let's turn to some technical questions. Doesn't relativity prevent interstellar travel? STAN: Of course not. Time slows down as things approach the speed of light. This has been demonstrated. At 99.99% of the speed of light it only takes 6 months pilot time to go 37 light years. I worked on nuclear fusion propulsion systems in 1961. Using the right isotopes of hydrogen and helium one can eject charged particles having 10 million times as much energy per particle as in a chemical rocket. HORN: Wouldn't it take too much energy to get to another galaxy? STAN: Who cares? Andromeda is over 2 million light years away. But within just 55 light years of Earth there are about 2000 stars of which roughly 50 are very similar to the sun. If I need a loaf of bread for dinner I don't worry about going to that great bakery in Sydney, Australia, or even one in Sydney, Nova Scotia. I go to the supermarket 2 miles away. The amount of energy required depends on the details of the trip. One astronomer calculating the required initial launch weight of a rocket able to get a man to the moon and back was too high by a factor of 300 Million. One thing he neglected was cosmic freeloading, letting mother nature do much of the work as we do on all our deep space flights. Astronomers have very little knowledge of space travel. HORN: What technique might be used to move around in the atmosphere the way saucers are reported to? 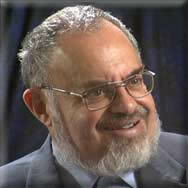 STAN: One of Friedman's laws is that technological progress comes from doing things differently in an unpredictable way. Lasers aren't just better light bulbs. The nuclear fission rockets I helped test almost 40 years ago are not just better chemical rockets. Entirely different physics in both cases. As I noted in my 1968 Congressional testimony, an attractive approach is magnetoaerodynamics similar to the electromagnetic submarine successfully tested in the mid 1960s by Dr. Stewart Way, but replacing seawater, an electrically conducting fluid, with ionized air another one. One technical-report literature search I had done noted 900 references; more than 90% were classified . Gets around all the problems of highspeed flight in the atmosphere. HORN: Here's a big question I'm personally interested in. Where do you think these visitors originate? STAN: The only UFO case that I know of that provides an answer is the fascinating abduction of Betty and Barney Hill in New Hampshire in September, 1961. Betty described a star map (model) under hypnosis . She drew it as a post hypnoctic suggestion by the skilled psychiatist hypnotist Dr. Benjamin Simon. It is in the first book "The Interrupted Journey". A brilliant woman named Marjorie Fish built 25 models of the local galactic neighborhood and was able to determine that the base stars in the map were Zeta 1 and Zeta 2 Reticuli in the Southern sky constellation of Reticulum. They are unique being the closest to each other pair of sun-like stars in our neighborhood. They are only 39.2 light years from here and only 1/8th of a light year apart from each other, and a billion years older than the sun. The work is described in detail in the new book due out in late July :"Captured! The Betty and Barney Hill UFO Experience" by Kathleen Marden (Betty's niece) and myself. We deal with the objections to both the case and the star map work. Not surprisingly none of the critics accurately described either. HORN: Can you gives us a glimpse of what your Roswell 2007 Presentation will cover? STAN: I will review the many technological changes that have occurred since July, 1947. Then there were no home computers, no internet, no space travel, no lasers, no supersonic aircraft, no fusion weapons, no microwaves or cell phones etc. Note will be taken of the 4 groups certain to be attracted to the Roswell story: A. Serious researchers. B. Nasty noisy negativists . C The government. (the last 2 have taken very strong stands that there can be nothing to UFOs therefore Roswell and MJ-12 can't be real). D The enthusiasts who are willing to bear false witness. I will review some of the religious aspects of the Roswell story, deal with the silliest attacks by the government and the debunkers, take note of some reasons for UFOs to be very interested in Southeastern New Mexico in July 1947. Should be fun. HORN: Thanks for doing this interview, Stan. Please tell people where they can learn more about your research.